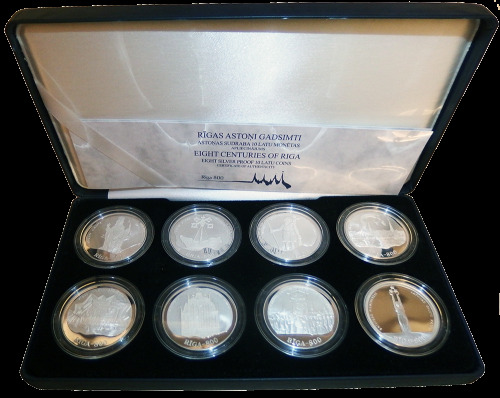 To celebrate the 800th Anniversary of Riga, the Bank of Latvia issued a series of silver 10-lats coins within the national collector coin programme, one for each century. This project is of both informative and of high artistic value. In anticipation of the 800th Anniversary of Riga, the Bank of Latvia organized a four-year-long project "Riga's History in Coins", which involved striking imitation antique coins. Each year, within the framework of this action, circulation coins in metal used within the territory of Latvia in various times were struck. In four years, using ancient techniques, Martins Mikans (Mikans Goldsmith's Workshop) struck four imitation coins in copper representing four periods of reigns of different rulers. The action was launched in 1998, during the Song and Dance Festival, when the Bank of Latvia, with the help of local authorities, arranged an information stand, "The Blacksmith's House", in the Dome Square. There, passers-by could obtain information about the coin programme and buy imitation gold guldens that were in circulation in Riga in the 16th century. These imitation souvenir coins were struck on the spot by a goldsmith of Mikans Goldsmiths' Workshop "Kalvis". At that time people from all the corners of Latvia visited Riga and they were really interested in the coin programme and the striking process - more than six thousand people walked away with souvenir coins. One year later, one could get his verdins of happiness in many places. Within the framework of large cultural events, this verdins of the free city of Riga (1565) was struck in Riga, Cesis, and Zoseni, and at the annual Open-air museum fair people from other regions of Latvia could also watch the coin striking process. Imitation ducats of the reign of the Swedish King Karl XI struck at the Open-air museum in summer 2000. Each passer-by could receive coins struck during the event, and every day goldsmith Martins demonstrated his workmanship by raising a sledgehammer for half a thousand times. Those who found this event interesting were attracted by the process itself, as well as by the possibility to get a coin still “hot”. In addition, "The Blacksmith's House" invited everybody to look at the coins commemorating the 800th Anniversary of Riga, receive informative materials, including a booklet dedicated to the event, as well as get answers to questions on money, and the process whereby it comes about, from Bank of Latvia specialists. In anticipation of the Riga 800th Anniversary celebration event in summer of the year 2001, the project "Riga's History in Coins" was completed. All four imitation coins: a gold gulden, a verdins, a ducat and a 4-kopeck livonaise were struck for four days, one type of coin per day, in Riga. These ancient coins represent four pages of Riga's history, since the history of money is a part of the wider history of towns and countries.